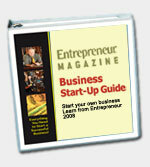 BusinessMart.com strongly recommends Entrepreneur Magazine's Landscaping Business Start-Up Guide. For more information read below. To purchase this book click on BUY NOW. Like working outdoors? Love nature? Then a lawn care or landscaping business is your chance to rake in plenty of green, while doing something you enjoy. Whether it's just picking up a few residential yards to make some extra money, or contracting with commercial office parks or apartments for the big bucks, you can quickly be on your way to earning the income you desire. Our guide will show you how. Youï¿½ll also get pointers and words of wisdom from successful lawn care and landscaping business owners whoï¿½ve made their personal dreams of prospering in a business they love come true. Startup costs are relatively low. Once you invest in the necessary tools of the trade, youï¿½re generally set for years. And you can set your office up in a corner of the den or spare bedroom. Best of all, youï¿½re in complete control. You can devote as much or as little time to the business as you want. Order your guide today, and start reaping the rewards.